In the 1990s biochemical purification and protein-protein interaction screening led to the identification of the IKBa protein kinase complex, consisting of two catalytic components (IKKa/IKK1 and IKKp/IKK2) and a regulatory subunit (IKKy) (Chen et al. 1996; DiDonato et al. 1997; Mercurio et al. 1997; Rothwarf and Karin 1999; Yamaoka et al. 1998). IKKa and IKKp show 52% similarity in protein sequence (Fig. 1). Both subunits can homo- and heterodimerize through a leucine zipper motif and harbor a catalytically active kinase domain in the N-terminus that is responsible for phosphorylation of IkB proteins (Mercurio et al. 1997). IKKy is structurally not related to IKKa and IKKp, but indispensable for stimulus-dependent activation of the type-1 NF-kB pathway (Yamaoka et al. 1998; Zandi et al. 1998). Despite their structural similarities, IKKa and IKKp were shown to have differing physiological functions. IKKa-deficient mice are viable, but exhibit perturbed B cell maturation and developmental defects of secondary lymphoid organs. The NF-kB response to proinflammatory stimuli in these cells is normal or only slightly impaired (Hu et al. 1999; Li et al. 1999a; Takeda et al. 1999). In contrast, IKKp-deficient mice die in utero because of massive hepatocyte apoptosis, a phenotype that resembles p65 deficiency in mice (Beg and Baltimore, 1996; Li et al., 1999b, c; Tanaka et al., 1999). Embryonic fibroblasts isolated from these mice show strongly impaired NF-kB activity and increased apoptosis after stimulation with pro-inflammatory cytokines or pathogenic agents. Apparently, IKKa cannot compensate for IKKp in the type-1 signaling pathways, while developmental defects after IKKa ablation can be explained by its unique function in the type-2 NF-kB activating pathway. Cellular IKKs form a higher order complex that migrates with an apparent molecular weight of approximately 700-900 kDA in gel filtrations (Yamaoka et al. 1998). Reconstitution using recombinant proteins revealed that the tripartite IKK core complex is only composed of the three subunits IKKa, p and y (Krappmann et al. 2000). There is evidence that cellular IKKa and IKKp preferentially form functional heterodimers bound to IKKy. As evident from single knock-out cells and immunodepletion experiments, IKKa and IKKp can also form homodimers. However, it is not clear whether homodimers are formed under physiological conditions when all three IKKs are present (Khoshnan et al. 1999; Mercurio et al. 1999). The stoichiometric relation between the catalytic and regulatory IKK components is still elusive. Studies using recombinant proteins or yeast expression systems suggest equivalent amounts of IKKa, IKKp and IKKy (Miller and Zandi 2001). However, in vitro cross-linking and ultracentrifugation indicated that IKKy oligomerizes through the MOD (minimal oligomerization domain) and might form preferentially trimers or tetramers (Agou et al. 2004b; Tegethoff et al. 2003). Even though open questions remain regarding this issue, the oligomeric state of IKKy is clearly important for activation of the IKK complex by physiological stimuli. Phosphorylation of IKKa and IKKp is critical for their stimulus-dependent activation. Two serine residues within the T loop of both kinase domains were mapped to be indispensable for IKK activity. Treatment of purified IKK with PP2A (phos-phatase 2A) or mutation of the T loop serines to alanines prevents IKK activation, while mutation to glutamate results in constitutively active IKKa and IKKp (Delhase et al. 1999; DiDonato et al. 1997). It was suggested that structural changes of the complex after binding to signaling molecules allow IKK trans-autophosphorylation, thereby triggering kinase activation. Cellular stimulation leads to IKKa and IKKP phosphorylation, but only IKKP phospho sites are critical for signal propagation in response to pro-inflammatory stimuli, which is consistent with results from gene-deficient mice (Delhase et al. 1999). In addition, several IKK kinases that belong to the family of mitogen-activated protein kinase kinase kinases (MEKKs) [e.g., NIK, MEKK1, MEKK3 and TAK1 (TGFP-activated kinase)] were suggested to be involved in IKK activation in response to various stimuli. In most cases the in vivo relevance is not clear because of possible compensatory effects in knock-out mice (Hatada et al. 2000). 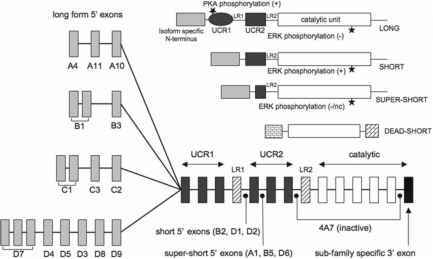 Intriguingly, regulatory ubiquitination of signaling mediators has been recognized as an essential step for IKK activation. Ubiquitin chains are thought to serve as platforms that position upstream regulatory kinases and the IKK complex to cellular substructures and thereby induce proximity and activation (see below Sect. 3.2). A considerable gap in our knowledge about the structural determinants of the IKK complex is due to the fact that there are no crystallographic data available yet. In addition, we need to learn more about the composition of cellular IKK complexes. Complex assembly is an important issue regarding the unique functions of IKKa and IKKP in the type-1 and type-2 NF-kB pathway, respectively. It will be important to elucidate in the future whether the different pathways are initiated from a single IKK holo-complex or whether distinct IKK complexes are connecting to distinct downstream effector pathways. Even though structural insights are limited, different studies suggest that not only the catalytic activities, but also the assembly and composition of the IKK complex represent interesting targets for therapeutic interference.